'Riverdale' season 2 premiere: KJ Apa & Camila Mendes dish on Varchie's hot shower scene, plus [SPOILER] died! Riverdale has officially returned with a darker -- and sexier! -- second season, and only ET has your exclusive behind-the-scenes scoop! 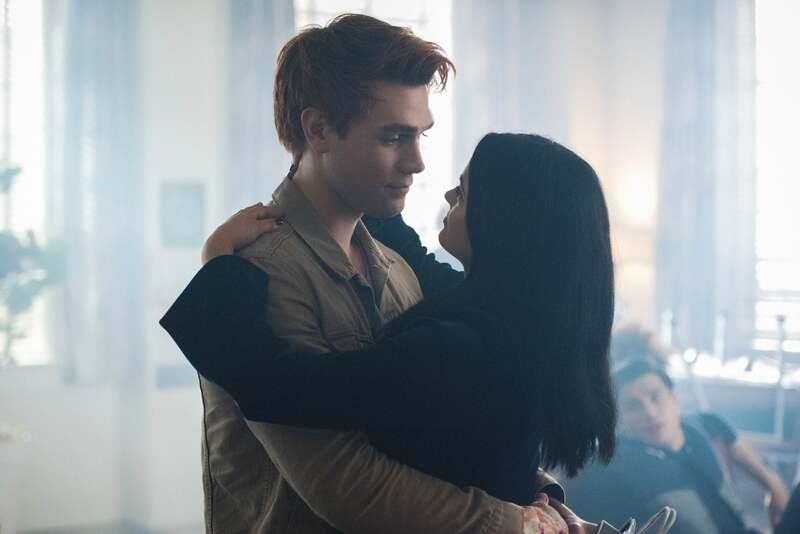 In this week's episode of Sweetwater Secrets, ET's new Riverdale aftershow, stars KJ Apa and Camila Mendes dish on Veronica and Archie's oh-so-steamy shower scene. Plus, Cole Sprouse spills on Jughead's brand-new motorcycle and what his "Disney self" would think about his sweet new role on Riverdale! The Good News: After making us wait almost the entire episode to discover Fred's fate, fans were able to breathe a sigh of relief because Archie's father is going to be A-OK after his brush with death at the hands of a masked gunman. Phew! Don’t ever leave us, Fred Andrews. You're the only sane parent in Riverdale. The Bad News: Miss Grundy's back! Yes, feel free to let out a groan of frustration. Miss Grundy -- aka Archie's former flame, music teacher and the character we hated most in season one -- made a brief return yet memorable return. As the cameras took us to the town of Greendale, Grundy was seen preying on a new teen boy with a smooch-filled piano lesson. Eww. Come, on girl -- find a man your own age. The Batsh**t Crazy News: The angel of death may have spared Fred Andrews' life tonight, but Miss Grundy was not so lucky. That's right! As Grundy kissed her student goodbye, she noticed that her living room window was open. Just as she started to suspect that something was wrong, a masked man -- the very same one who attacked Fred! 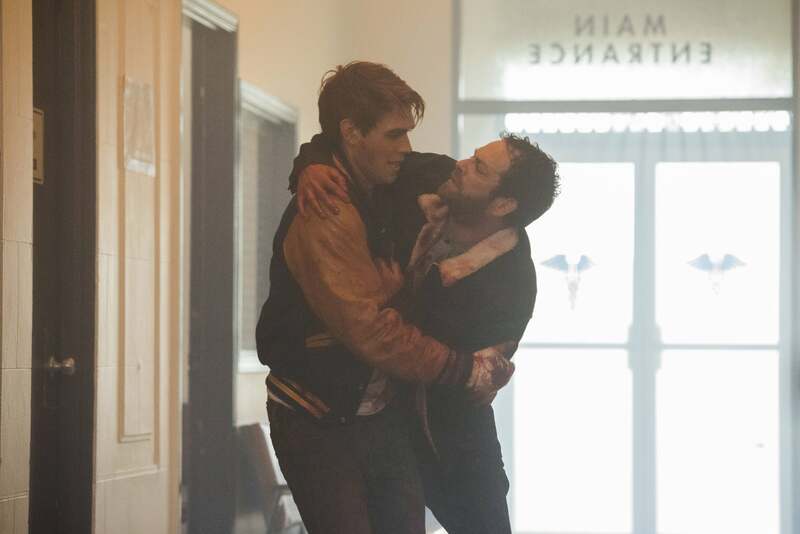 -- strangled Grundy. To make matters even creepier, the murder weapon was the cello bow that Archie gave Grundy as a gift. Dun, dun, duuuuun! Who else is still swooning from Veronica and Archie's oh-so-hot shower scene? We see you all out there frantically raising your hands! So when we recently visited Riverdale's set in Vancouver, Canada, we got the behind-the-scenes scoop straight from the stars on what it took to film that sultry scene. "I knew [about the shower scene] way before I read the script," Mendes confessed to our cameras. "Roberto [Aguirre-Sacasa,] our showrunner, had told me that there was going to be a really steamy scene and I was like OK, I'll get ready! I've got a month to physically prepare myself." "But no it was really fun," she added with a laugh. "It's kind of funny playing a scene like that and having a whole camera crew like, right around you, but KJ always makes it so funny that it's a blast." "It was pretty slippery in there," Apa revealed. "They had a fog machine in the actual bathtub." Apa added that he and Mendes shared a lot of laughs together during that scene. "We would just start cracking up laughing because none of [the crew members] were allowed to look at us while we were unclothed. But yeah, it was funny." So what was the most difficult part of acting out Archie and Veronica's steamiest scene yet? "Making out in the water," Mendes revealed. "Like, we just wanted to spit it all out, but we had to make out, so we were just like plegh! [It was] the funniest moment -- It was a lot of fun!" For more on-set details straight from the Riverdale cast -- including Cole Sprouse's hilarious conversation with his "Disney self" -- press play on the video above! Make sure you tune each week intoSweetwater Secrets -- your go-to source for all things Riverdale -- on Entertainment Tonight's YouTube channel. Each week, we will be bringing you exclusive interviews with the cast before, and immediately after each episode of Riverdale Season 2.